This three tiered wedding cake was a homemade red velvet cake with cream cheese filling and vanilla buttercream. 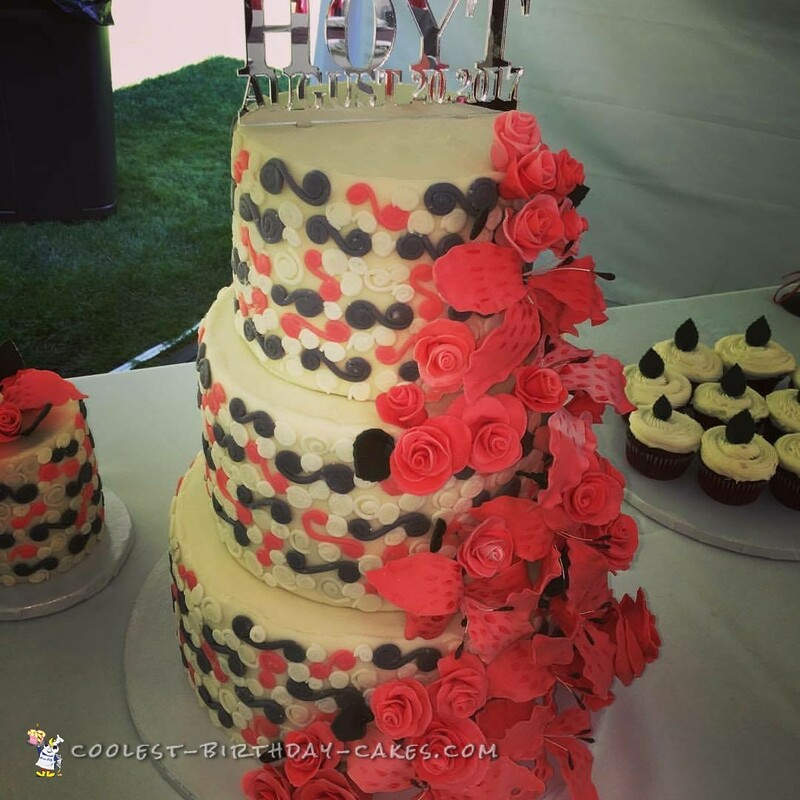 Each tier was covered with white modeling chocolate. Then it was decorated with grey and coral embellishments that I hand made and attached with melted white chocolate. The roses and Stargazer Lilies were made from homemade gum paste which I first colored and then cut out each individual petal and hand painted. I also attached wires to every Stargazer Lily petal, allowed to dry overnight, grouped them in fours and wrapped them in floral tape. These were very delicate and were difficult to bind without breaking them somehow. I attached all of the flowers after I delivered and stacked the cake at an outdoor venue. The topper was custom made. The modeling chocolate held up beautifully in the August heat and the guests loved the end result. This beauty took me at least 12 hours to complete and I loved every minute of the process. I cannot wait until my next wedding! In addition, you can check out more of my cakes on my Facebook page here.